Samsung is positioned to reveal its newest flagship Android phone, the Galaxy S10, at an "Unpacked" press event on Feb. 20. Here's what we know about the forthcoming iPhone competitor. 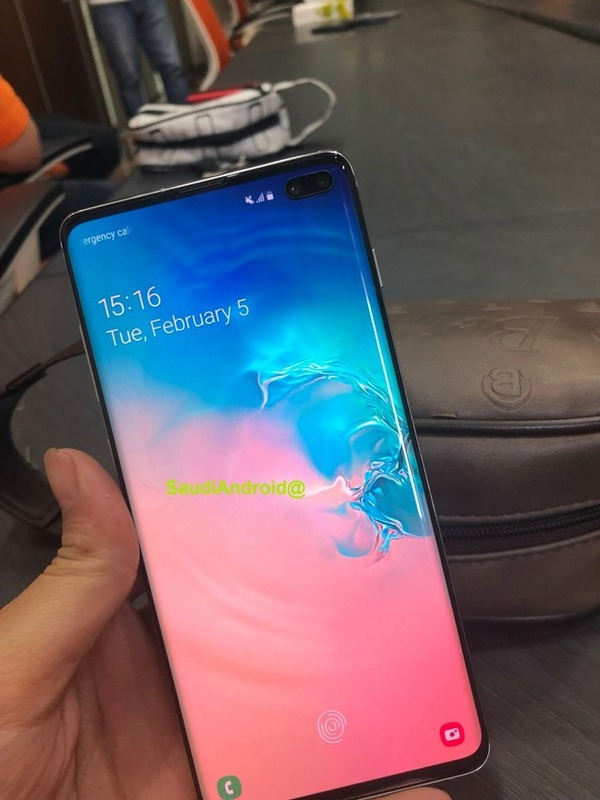 The standard S10 is expected to feature a 6.1-inch, 1,440-by-3,040-pixel OLED display, with its most attention-grabbing feature being a "punch hole" for the front-facing camera -- allowing it to grow screen area while sidestepping the notch found on devices like the Essential Phone or the iPhone XS. Samsung is the world's leading manufacturer of smartphone OLED panels, including the one used in the XS. The S10 should also sport a Snapdragon 855 or Exynos 9820 processor, depending on the market, and at least 8 gigabytes of RAM. Some rumors have pointed to configurations with up to 12 gigabytes. Storage options are expected to range anywhere from 128 gigabytes to 1 terabyte. Ports are predicted to include USB-C and 3.5mm audio, and cameras could include a triple-lens rear configuration with 12-, 13-, and 16-megapixel sensors and improved stabilization. Some top-end specifications could be limited to the S10+, which should also have perks like a 6.4-inch screen and a dual-lens front-facing camera. Both devices could have in-display fingerprint readers, a change from the rear-mounted readers Samsung has typically relied on. They may further gain improved face detection. 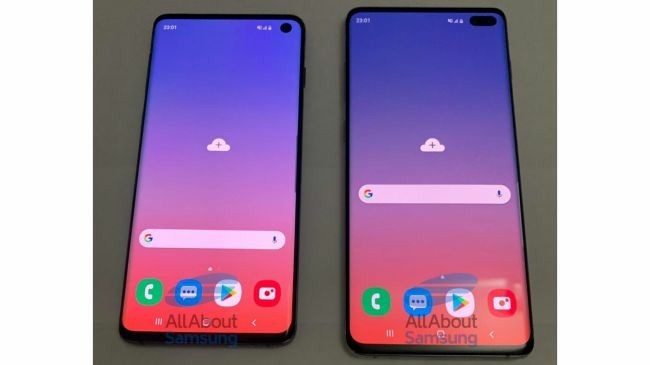 A supposed leak of the Galaxy S10+. 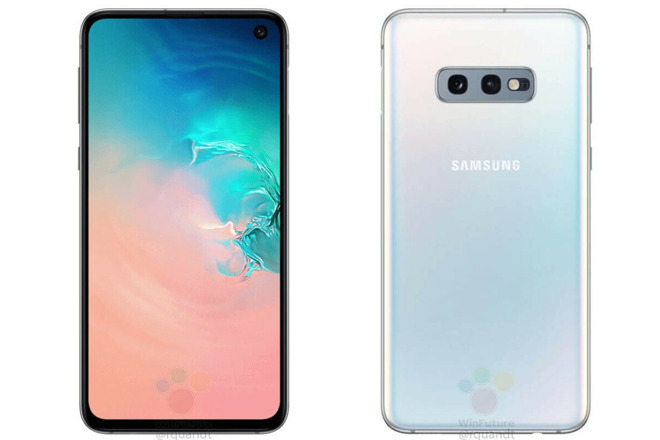 A rumored third model, the "S10 E" or "S10 Lite," may arrive as a less expensive option, at the cost of size, power, and one less rear lens. 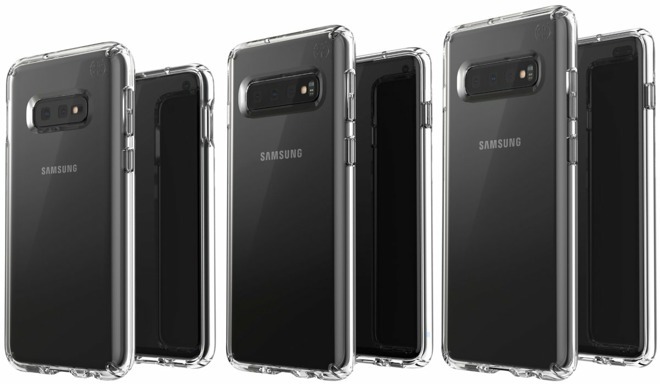 There has been some debate if the "S10 E" will have a headphone jack or not, but the latest alleged leak of marketing renders seems to show one. Pricing for the Galaxy "S10 E" is expected to fall somewhere in between $650 and $750 -- important given that the regular S10 may start at $779. The S10+ could be at least $840, blowing past the $1,000 mark for higher storage tiers. Alleged benchmarks for the Snapdragon 855 have indicated that the S10 might technically be slower than 2017's iPhone X, but even if authentic the difference is unlikely to have much real-world effect. Samsung's Galaxy S line is usually seen as the most direct challenge to iPhones, since it has comparable prices and specifications. The company's Note line helped popularize large "phablet" screens, but is priced out of range for most people. Can't wait for Apple to spend billions on ads making fun of those ugly holes!! Oh wait, Apple doesn't care about iWannabes. A Windows 10 PC with an SSD and 8GB RAM performs great. And people think they need 8 or 12GB in a phone? Running Android Fisher Price Apps? Looks like Samsung went for the glory hole design. Android is garbage. They will use specs to SEEM superior and the few loud idiots will eat it up. There's been rumors around that Apple might move to the same general "punch-hole" design and rid themselves of the notch. Wouldn't Apple go the iPad Pro design? I have no idea. The only rumors I've come across was the one I mentioned. Rumors are rumors are rumors until they're not. Where? Has AI done a story on this? I usually catch them all but can't think of this one. "All we need to know about Samsung's upcoming iPhone rival...": It's a Samsung. I predict this will do about as well as the S9, which is to say not terribly well. The "hole punch" would be impressive if that was for FaceID-grade authentication, but of course it isn't. As for the placement of the camera array on the back: it's going to take lots of truly amazing photos of your hand. Also looks like they're doing the iPhone thing where higher end models get more lenses. I thought I saw one a while back but I can't place it, so I might be imagining things. Unless they have a way to have the cameras see through the display they'd have to have an awfully big hole for FaceID. Or they could do a forehead again, but I doubt they'd go back to that. As I've said before, I actually like the notch - it's functional and makes better use of the screen space, IMO. It will be interesting to see if Sammy has an in-screen fingerprint reader (and how accurate it is.) I'd rather have a notch with FaceID's top-notch accuracy than a mediocre in-screen fingerprint reader. There's been a couple others I came across since but I don't know if they were all reporting from the same source, and TBH I never put much stock in early rumors and so didn't pay that much attention. I’ve been using iphones since iphone 3s and am fully invested in apples ecosystem with several iPads, mbps, Apple TVs, Apple Watches, iCloud subscription, Apple Music and airplay2 compatible speakers. Current phone is a 256gb xs but I think my next phone will be an android and I will be moving out of the Apple ecosystem. Apple feels like the bad Apple of old right before Steve came back. Products lack differentiation and extremely slow to refresh... not to mention they’re way overpriced. For example, the iPad Pro is priced like they’re high end laptop wtf?? The air charger... I didn’t even bother. When your customers start feeling like they’re being robbed constantly, the brand has a serious problem. I still remember buying my first gen ipad at about $500. Those were the days - yes Apple products command a premium as they should but you feel like you’re getting value for your money. Now it’s way above premium and nothing to show for. Also Apple is taking this nonsense about craftsmanship and making things last to an extreme illogical end. These are IT products you are not making high end furniture. You need to refresh your product lines at a faster clip if nothing else to bring some excitement and energy to the brand. The MacBook is embarrassingly long in the tooth. And Apple doesn’t seem to be pushing the boundary of cutting edge hardware. The iphones have been surpassed in camera tech and battery life is below average. Wifi and lte connectivity are not the best either. And all the talk about being good at integrating hardware software and services... remains just talk. Apple is so far behind Google when it comes to software and services it’s not even a fair comparison. Maps is not as good as Google and Siri is just frustratingly dumb. iCloud/iTunes feel like last century... If not for the stability of iOS I really don’t know why anyone would choose an Apple phone. Ah, the Forbes Contributor Network....say no more. So much nonsense, what to select. Ok iPad: if you don’t want the top-tier offering, go with something else. The entry-level is only $329, how can you complain? But if you don’t believe the Pro has something to show for the price, you’re nuts. Actually, yes, making good CE products is like making high-end furniture. If you knew Apple as well as you claim, you’d know Jobs spoke about that analogy specifically, when his father taught him why the backside of good furniture is also finished, while cheap furniture is left unfinished on the back. Excitement & energy? Hmm so they’re already the wealthiest public corp in history because people throw their money at them time and time again. iPhone is the single-best-selling smartphone as far as I know. Call me crazy but the excitement and energy is there. Oh, but you’re a longtime Apple guy...thanks for clarifying. The hole is easier on the eyes than the notch. I have an iPhone X and the notch is always annoying (although less so after some time). You made some good points, but a lot of strongly-biased nonsense, too. To answer your last question — why would someone choose Apple — you answered it, the ecosystem. I'm able to sit down at ANY Mac, create a User account, add in my iCloud credentials and it's like it's my Mac. All of my files, my keychain items, my contacts, my mail... it's all there, magically. Buy a new Mac, do the same thing, and boom! It's all there. I've done this a dozen times over the past 18 years and I stand by it... Macs are for me, and iPhones complement Macs perfectly with the same cross-device sync and integration. It just works. But hey, we're off-topic here. This article is about the Samsung Galaxy S10. If you ask me, nice try Samsung. Sure, it looks like decent hardware, but users still get the same disjointed experience. Samsung's version of Android will never feel as polished and singular as iOS does. Jonny said that and yes I’d go with the analogy as it relates to quality and care. Who can say no to that? But when you allowed the macbook to go on this long without a refresh, it’s not craft it’s lazy and neglect. You’re ignoring market reality. When iPhone and ipad came out they’re pretty much one of a kind magical products. Even then they’re priced very well relatively to their nearest competition. Now you can compare the iPhone to any android premium model and any reasonable person will conclude that they have caught up or even surpassed iphones hardware. So yes I can get the iPhone 5c or xr or entry level ipad to save a few bucks but why should I when the same money can get me the premium model in the android universe? The excitement for Apple has waned. The ads are boring. The reveal as well. And even sales will continue to slide if Apple doesn’t do something better. Relying on past success and the so called upgrade cycle is not a strategy. If I’m considering moving out of Apple ecosystem then I’m sure more are thinking the same.